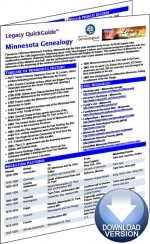 A listing of essential North Star State resources compiled by the�Minnesota Genealogical Society. You’ll find everything you need to get started on finding your Minnesota ancestors. This was presented to a live webinar audience on June 7, 2017. 1 hour 28 minutes plus 5 pages of handouts. The recording is also included as part of the�monthly�or�annual�membership.